The likes of Samsung, Huawei, and Motorola are all set to announce their first foldable smartphones later this year. Apple, however, isn't expected to unveil its offering until the second half of 2020 and, with such a long wait ahead of us, details about the device are rather limited at the moment. But thanks to the folks over at LetsGoDigital, a recent patent which sheds some light on Apple’s future offering has now been uncovered. 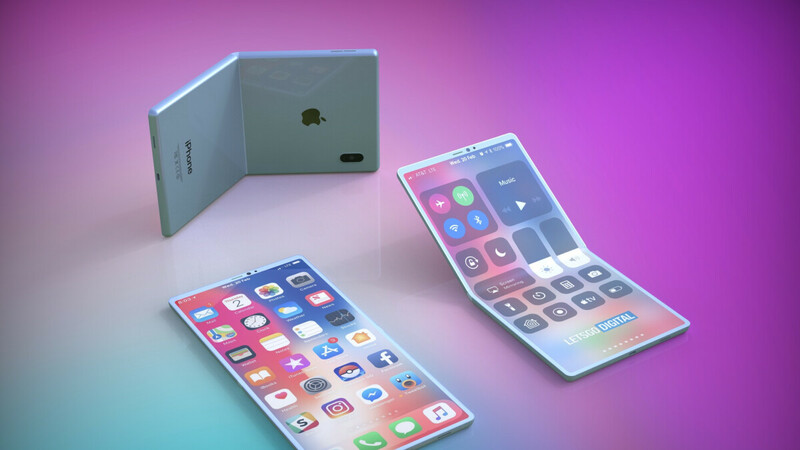 Unlike the adaptations from Samsung and Xiaomi which are expected to fold horizontally, Apple is seemingly developing a smartphone that can be folded vertically, much like the upcoming Motorola RAZR. Looking at the front of the envisioned smartphone, it seems Apple is aiming for an almost entirely bezel-less design that sports no notch. When opened up, the device can be used just like any of Apple’s recent iPhone X-branded devices. However, there are a couple of options when it comes to folding. If users wish to use just a smaller portion of the display, the smartphone can be folded outwards in half, giving them access to either the upper or lower area of the panel. Alternatively, the smartphone can be folded inwards. This deactivates the display entirely and lets users easily store the device in their pockets. Unlike most competitors which have now filed more detailed patents, Apple’s one is relatively simple and doesn’t provide any information in regards to the smartphone’s functionality. Nevertheless, these are details that will likely emerge over the course of the next year. Elsewhere, the documentation doesn’t specify anything about the number of cameras on the rear either. With rumors of a triple-camera iPhone in 2019 gaining pace, though, it seems likely that any foldable offering from Apple will feature at least three cameras on the rear. Lastly, there is no indication as to whether this phone will support 5G or make the jump over to USB-C. 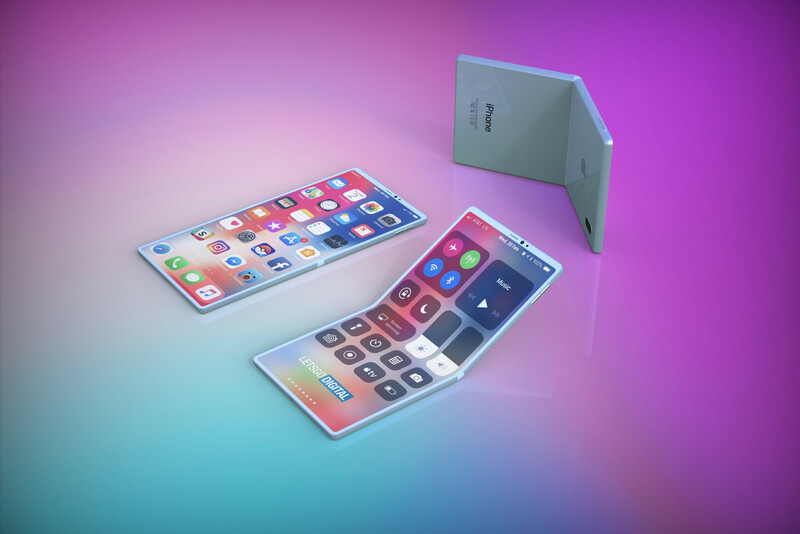 These features are, however, expected to feature on Apple’s regular iPhone series in 2020 that launches alongside its foldable alternative. Who cares if there’s a notch ? What part of concept render don't you understand? phonearena.com = regurgitated tech news, promotions from slickdeals.com and 10$ dollar concept render, writing articles with sole purpose of starting fanboy warfares. anything for a few clicks am i right? Don't know if you're right, but they got you to click. You clicked so we're obviously doing a smashing job! Have a great day trolling website forums/comment sections! So it is a iphone 6plus again? #bendgate :) Seriously though I like idea of a vertical folding phone better. The Motorola razr concept looks great to me and it will fit easier into pockets. Uhmm...who uses just the top or bottom half of their phone?? I get the inward folding design like the new Motorola Razor render, but the outwards fold...wouldn't that be too small to use for any practical use scenerio - aside from maybe using half the battery life?? How does this take away from the achievements of other companies? If anything it shows how Apple is going to release its device over a year after the competition. As the immortal words of Steve Jobs would put it.. You're just using it wrong. I think it looks pretty good. But is it not apple fans that say Samsung phone are to tall and to narrow, HELLO That will be really tall and narrow. It doesn't look tall at all, looks pretty much like current iPhones. Same 7 row of icons. Where did you get the idea that it will be really tall? It's tall and narrow, you can see that. But hay, like i said, it looks nice. Well it wil have the same boring icons and the same most boring OS! I can't think any better way to fill my home screen than with those boring icons. The more icons i have the faster and more effortlessly i can open different apps which i use daily. I use almost all of my first home screen apps every day. Why would i waste my valuable space for something else? I don't need little bit bigger screen (i have my big tablet for that already) like those other foldable ideas so i like this idea lot more. More compact phone inside pocket and normal size screen when using, sounds good. Still overall don't like the idea of opening something almost always when i want to use it.